A couple of weeks ago, I got one of those emails you can’t say no to. Well, if you are a meat eater that is. Vegetarians might not be too keen on sampling some gourmet meat, but there you go. We very much love meat in this household, so when the lovely people from Westin Gourmet offered to send us one of their gourmet meat packs, Ben couldn’t wait for the courier to arrive. On delivery, all the meat was vacuum packed and cooled with hydrated ice sheets, food grade gel packs and insulated boxes. This meant that the meat, which is by the way cut on the day, was as fresh as possible and we could choose whether to use it immediately or freeze it for later use. Regarding the sheer amount of meat, we had to portion it up and freeze the majority of it, but it didn’t do it any harm. After defrosting it, the meat was still juicy and full of flavour and over the last couple of weeks, we put its quality to the test by preparing a number of different meat dishes, which I’ll feature on the blog in the coming weeks. We used the steak mince for a chilli con carne and a mince-based Indian curry that we served with rice, a sliced onion cachumber and some wraps. We had the steak with homemade chips, coleslaw and homemade Jack Daniels sauce and we enjoyed the pork chops with a topping of duck liver pâté and melted cheese – it was absolutely divine and they were by far the best pork chops I have ever tasted. We still have some of the sausages left, but the ones we had in a sausage casserole with mushrooms were gorgeous and you could really taste their quality. The burgers starred at our latest BBQ and got absolutely amazing feedback. Everybody mentioned how tasty they were and that you could really taste the difference from your regular shop-bought burgers. I have to say that all the meat was of outstanding quality and that we will definitely be back for more. We haven’t used meat delivery companies before, because I always found them just so much more expensive compared to your average butcher, but the overall quality of both the meat and service we received from Westin Gourmet has really convinced us. 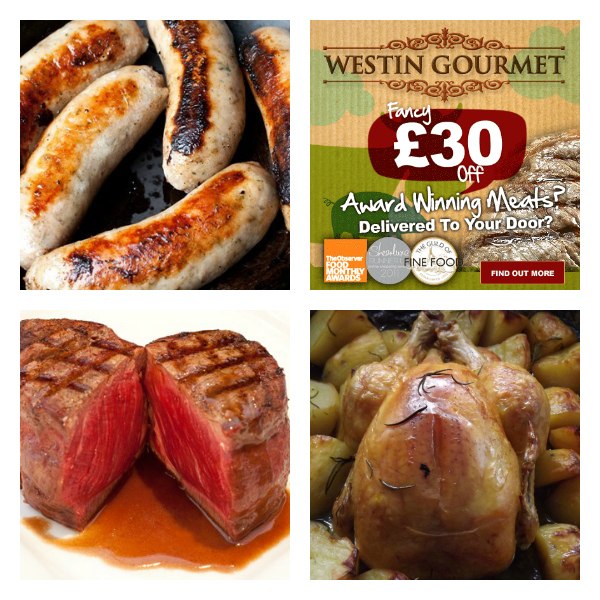 If you want to try some of the meats yourself, click the Westin Gourmet banner in the sidebar and it will take you straight to the offer page. Disclosure: We have received the Gourmet Variety Selection free of charge for the purpose of this review. All opinions are our own and have not been influenced by Westin Gourmet. The banner in the side bar contains an affiliate link, which means that I will receive a little commission, if you decide to buy something. I have read many great review of this company – must get round to trying their products myself!